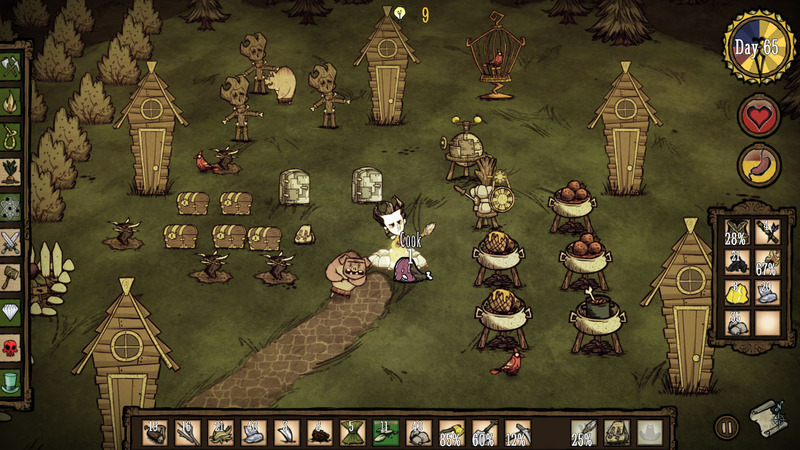 For day #14 in the Game a Day Challenge, today we tested our will to survive and dove into “Don’t Starve.” Don’t Starve is a open survival game which requires players to build a home and sustainable living arrangements while worrying about their health, hunger, sanity, and all manner of wild beasts. Don’t Starve does have an “Adventure Mode,” which is more or less the equivalent of a story mode. We elected to consider the game a success if we survived 30 days in the never ending survival mode instead because, well, to be quite blunt adventure mode is hecka hard! There is no realistic way that someone like me could beat the game when those with much more experience and skill cannot get passed more than a couple stages. So lets get into the game, Don’t Starve is fantastic! Absolutely fantastic. It is common knowledge that I am not a fan of the notion of “open world” or “endless” games, but Don’t Starve somehow made me a fan and should be considered and one of the most, if not the absolute pinnacle, of exceptional examples from the genre. After starting at day 1 with nothing, and I mean absolutely nothing, I was able to hunt, gather, scavage, and mend a couple machines which expand your tech tree, manage a farm, become a bee keeper, hatch and attempt to raise a baby bird, declare war on pigs, and fight Krampus. All in all, not a bad way to spend a day gaming. The reason I enjoy Don’t Starve so much is that the game is dynamic and filled with possibilities, many of which you may never discover. The essentials are more or less strait forward, but if you want to get creative and try new things there is a wealth of opportunities to play around in this gorgeous, highly stylized world.